These drops feature the classic Pear cut. The key to cutting a good Pear shape is reducing the bow-tie effect that appears in the lower mid section of the stone. Keep this brilliant pair in full focus by sweeping your hair into a loose updo. All Carat* London products come with a 1 year warranty. Earrings are not eligible for return outside of their given warranty policy due to hygeine risks. Heidi & Scott Thompson have worked together since 2003 building CARAT* London into one of the most luxurious & affordable brands in the industry. CARAT* London uses the traditional methods Scott Thompson learned in Vicenza, Italy & high quality synthetic, man made gemstones to create classically beautiful jewellery for the modern woman. Ranging from £79 - £779, CARAT* is a brand that is truly accessible to anyone who desires admirably glimmering pieces made to be worn rather than hidden away in a safe. Each CARAT* London collection has a singular design focus that is never mirrored or repeated in their other collections. Every range is timeless, sleek, & sophisticated. 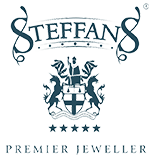 As an official CARAT* London stockist, Steffans Jewellers stock the finest & most exclusive jewellery pieces from the CARAT* London range, ensuring you receive pieces of outstanding beauty & style. CARAT* London gemstones are crafted to meticulously high quality, normally exceeding GIA accepted cutting tolerances and scoring a D or E on the GIA colour scores, with E being the highest possible ranking. Stones are typically a clarity ranking of IF (internally flawless). Due to their size, larger stones may have a ranking of VVSI (very very small inclusions) with imperfections essentially invisible to the naked eye. All stones & mountings have a lifetime guarantee against colour changes & defective workmanship. The ideal behind CARAT* London is fantasy rather than reality; that everyone should have access to their dreams. The collections feature pieces that are beautiful and admirable, yet are more affordable and accessible than their 'real' counterparts. Nothing will ever top the glamour of real diamonds, but CARAT* gemstones are the next best option to building a luxurious collection as dazzling as you! All Carat* London pieces are packaged in authentic Carat* London packaging. Feel free to call a member of our team on 01604 622090 or e-mail online@steffans.co.uk. We will be more than happy to assist you!